Former 88' 750 Ltd. owner circa 2011. Just picked up a '91 907ie. 21,000 original miles. She looked pretty, but the tank was full of old gas and varnish. Off to the local ducati guru who has a soft spot for Pasos for a full service. Picked up a FIM Ultimap chip combo off of E-bay. My guy has the controller to tweak it. It's nice to have a great mechanic who is psyched to se a 27 year old bike roll in the door. Soooo... Tank cleaned out of nastiness, new fluids belts tires etc. The Ultimap FIM Chip I bought is a non starter. Fuel pump goes on but no spark. So my guy put the stock chip back in and it runs fine. He's a factory certified Ducati tech and racer who has a soft spot for pasos. He did a few tweaks to richen things up. Anyone else ever get a bad chip? My guy says that's a first for him. Anyway, the bike runs great with a nice fat midrange. I'm into it for around $3,000 including full service, tune and tires. I did get a great deal on the initial purchase though, and the orig owner has visiting rights! Looks like a beautifully kept example, well done on getting her all sorted. 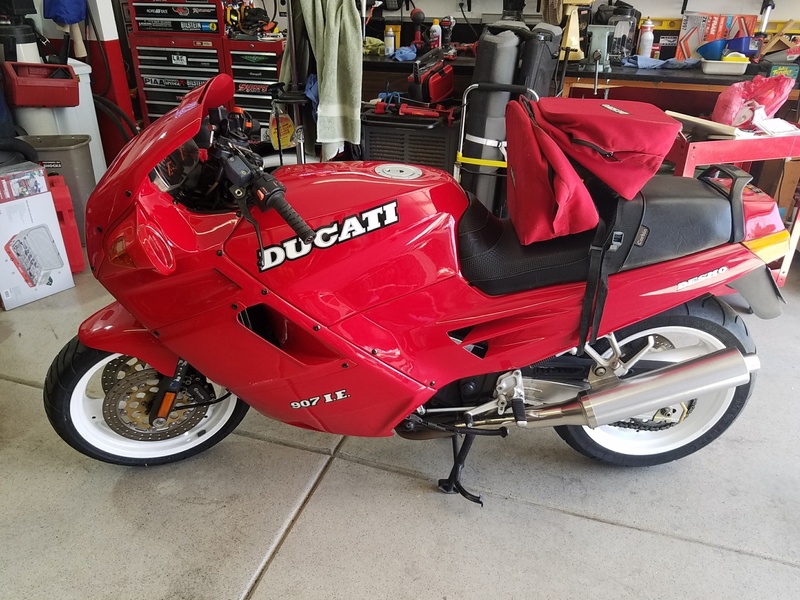 Installed a Fast by Ferracci Stage 2 Chip and had her re-tuned. It pulls hard from down low and the powerband is fat and smooth. I wasn't sure about her when I bought her, but this is one heck of a bike. A keeper for sure. I assume you just take the top off the ECU unit and plug in the chip in the proper place? Never done that before so am looking for info. I had a '91 that had the Fast by Ferracci complete unit in it and it was great. I have now bought a 1992 that has 15K original miles on it (bought new and stayed most of its life in San Diego). Unmolested and stock (except for Corbin seat like you have) except PO deleted side reflectors. What was involved in the tuning of the bike after installing chip? I assume you bought chip from Ferracci since them seem to still be selling parts. Cost? Thanks for your help. Undo the three retaining / mounting nuts, slide the ECU out the side, and flip it over. (also, either take out the battery or cover it. trust me on that). Remove the 4 machine screws and there's your chip. Look for the notch on the chip to determine orientation. I recommend getting a chip puller as the prongs are easily bent. I have a friend who is a Ducati tech. He tuned my bike on his gas analyzer ( there is a recessed screw on the side of the ECU). After contacting Eraldo he told me what Stages were for his chips. Stage 1 is for slip ons. Stage 2 is for engine modifications. Stage 3 is for 944 kit (don't know what that is). I have a stock set up and he advised if bike running great don't mess with it. Quick answers and very friendly, would like to buy something from him. Truly a friend of Ducati people. Intere sting. My bike ran fine, but I couldn't leave well enough alone. My bike came with slip ons, and I had a K&N installed when getting her up and going. Runs stronger with the stage 2. stage 1 and 2 not that different. Like the guys from Ferracci said, if you are happy , don't mess with it. Stage 3 is for 944 kit (don't know what that is). 944 is if you swap to ST barrels... you get more capacity, hence 944. Anyone had experience with this set up - Fast by Ferracci stage 1 chip with K&N air filter only. I have stock pipes, no aftermarket slip ons. I am going to do this, just wondering if much difference in performance if anyone has done this same set up. Ferracci says increases power and deliver on total power band. Sounds good. Without dyno no way to tell actual horse power increase.